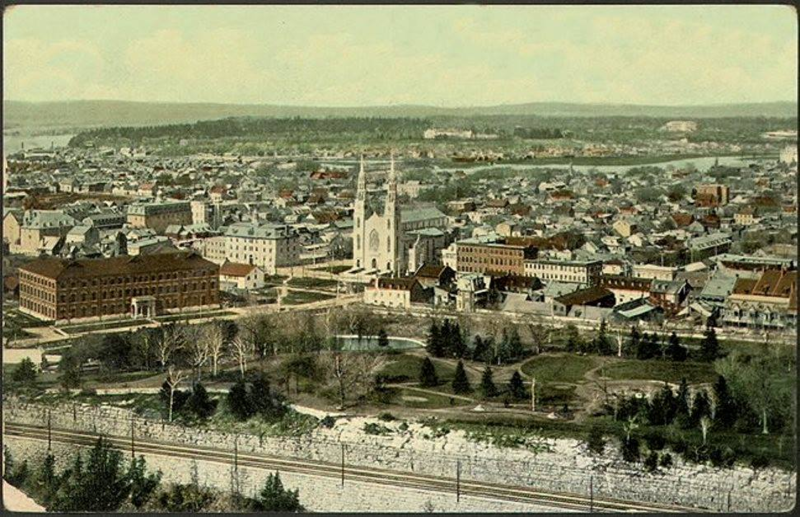 Lowertown, Ottawa, circa 1910. Source: Archives de Québec. Lowertown is the oldest and most storied neighbourhood of early Ottawa. Canal workers, lumbermen, and entrepreneurs were among those contributing brawn and brains to the area bordered by Rideau Street and the Ottawa and Rideau Rivers. It contains the city’s oldest public square (Anglesea), oldest public park (Major’s Hill) and oldest city playground. Colonel John By’s legacy extends beyond the engineering marvel of the Rideau Canal. As the original town planner of Bytown, his influence over Lowertown is still evident in the layout of streets, the presence of the ByWard Market and the history of military control of property. As land ownership became possible, more substantial buildings of clapboard, brick and stone followed earlier rough log and timber structures. Urban planning consequences continue to affect this founding area of Ottawa. In the 1960s, urban renewal generated the demolition of hundreds of homes, the dislocation of numerous families and the disruption of established street patterns. The transformation of King Edward Avenue from a stately urban park to an urban truck route was part of this major planning disaster. Over Lowertown’s first century, French Canadian, Irish and Jewish residents shaped the community and built both humble worker cottages and grander mansions. Their vibrant history is reflected in two Heritage Conservation Districts (HCD) designated under the Ontario Heritage Act—Lowertown West HDC and Byward Market HCD—and in numerous individual buildings designations. 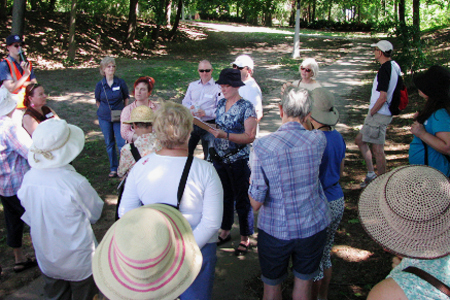 LCA Heritage Committee Co-chair, Nancy Miller Chenier, leads a heritage walk through east Lowertown in September 2013. The Heritage Committee works to protect early survivors as well as later architecturally designed residential and commercial buildings. With residents, we record and communicate the stories of Lowertown people. This collective knowledge aims to honour Lowertown people, buildings, landscapes and places of cultural significance. We welcome anyone interested in this work. Send us an email or complete the volunteer form stating your interest.